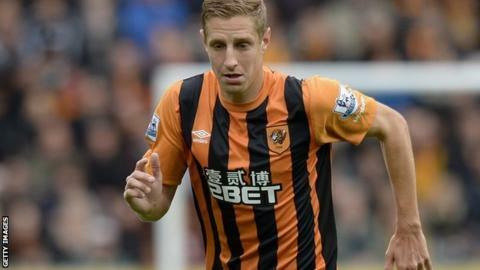 Hull City defender Michael Dawson has been ruled out for at least three weeks with a hamstring tear, according to manager Steve Bruce. Scans showed the 31-year-old suffered a grade two tear during last weekend's 2-0 Premier League defeat by Chelsea. "It could be anything from three, four, five weeks minimum," said Bruce. Robert Snodgrass remains sidelined after dislocating his kneecap in August, while fellow midfielder Mohamed Diame and striker Nikica Jelavic have been absent with knee problems. "That's happened too much to us from the first day of the season with Robert Snodgrass to Dawson, to Jelavic to Diame," said Bruce. "We could do with a little more luck because we've had four or five with pretty ugly injuries." Dawson will miss Premier League games against Swansea, Sunderland and Leicester this month, the visit of Everton on New Year's Day and the FA Cup third-round tie against Arsenal. He has made 11 appearances for the Tigers since joining in the summer after a nine-year spell at Tottenham.